Description: The 4427 poses with the 4451 after a day of switching. 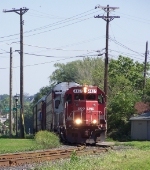 Description: CP Transfer 1 passes Dayton's Bluff. Description: A string of matching Soo Line locomotives sits outside CP's Saint Paul shops. Description: Todays transfer one has a nice pair of Soo GP38-2s for power. The 4423 had a really nice horn. Description: The CP's Transfer 1 backs up towards its work. Description: Two Geeps start the local freight westward after spotting some hoppers on the east side of Brooten. Description: This GP38-2 still proudly wears its Soo colors. Description: Another shot of the 4427 under a nice June sky on the prairie. Description: CP's local sprints west between Brooten and Sedan with a Soo Line Geep leading the way. Description: Humboldt One heads up to Shoreham, only to turn its train so it will be facing the opposite direction on the way back, to ease switching the Grove. Title: SOO 4427 Tomah Sub. Description: Road Switchers Power at Rest. Description: SOO still lives in Minneapolis! Description: This shot would have turned out as planned is those two cars were had pulled up just a few seconds later. Anyway, Soo 4427 pulls ahead and clears Lexington Ave with CP 4620 trailing. Description: The Paynesville sub local pulls ahead to tie the train down.